Mood board: Within luxury fashion, there’s long been a tension between art and commerce, financial success and creative freedom. 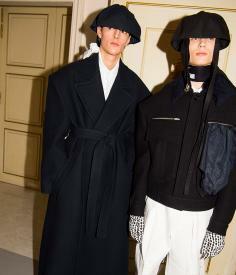 It’s fitting that for Raf Simons’ debut eponymous collection since his abrupt departure from Calvin Klein last December, models strode the couture salon-like catwalk in a sprinkling of fighting fit hats resembling army helmets. For the Raf Simons fans that flocked to Instagram at the end of last year, both mourning his luxury house exit and welcoming the attention that would return to his own avant-garde label – one suffused with music mythology, Belgian fashion codes and rebellion – this was a real menswear moment. In a show divided into two halves – one with a Joy Division soundtrack followed by a ten-minute intermission and second-half performance by Belgian post-punk band Whispering Sons – oversized silhouettes took centre stage. Sweeping double-breasted, opera and trench coats imagined in a range of fabrics, including bright or pastel couture-like satins, embellished with enamel flowers dangling from punky hooks. Stompy workwear boots, motorcycle gloves in leopard print and skinny skull print scarves. Simons is a longtime fan of David Lynch – his A/W 2016 show was dedicated to Twin Peaks. For A/W 2019, chunky sweaters and sweeping outerwear came with patches emblazoned with scenes from noir films Twin Peaks and Wild at Heart. The latter title a poignant reflection of Simons’ own creative energy. Scene setting: Elegance returned to the men’s catwalk last season, an aesthetic seen prominently on the dazzling satin coats in Simons’ S/S 2019 collection. For autumn, the designer reemphasised this opulence, with a setting a far cry from his preferred seating-less warehouse settings. Guests took seats in the gilded, chandelier-lined rooms of the Hotel Shangri-La, in an ode to the traditional salon shows of Haute Couture past. The soundtrack and post-punk interlude provided ample Simons edge.